Princess Ballet (Ages 3-5) Princess themed ballet class that includes basic ballet technique, games a craft and a performance at the end of the session. 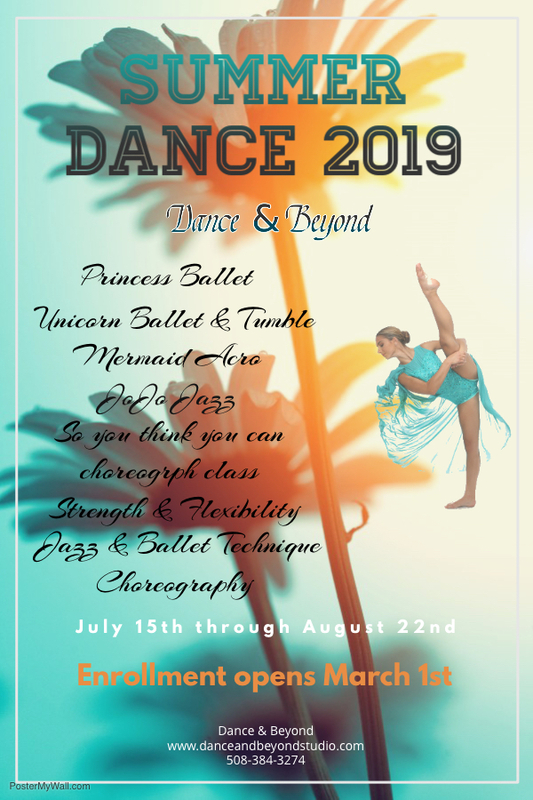 Unicorn Ballet & Tumble (Ages 3-5) Unicorn themed class that includes basic ballet technique combined with beginner tumbling. The class also includes games and a craft followed by a performance at the end of the session. JoJo Jazz (Ages 6-9) A JoJo themed jazz class all about BOWS and SASS! This class will include basic jazz choreography along with games, bow decorating and more. A performance will be held at the end of the session. Mermaid Acro (Ages 5-8) A Mermaid themed acro class where you will learn acro skills mermaid style! This class will also include games, a craft and a performance at the end of the session. Jazz Technique 1 (Ages 6-9) In this class students will focus on basic Jazz Technique to bring their dancing to the next level. It will include a warm up, across the floor and center floor work. Ballet Technique 1 (Ages 6-9) In this class students will focus on basic Ballet Technique to bring their dancing to the next level. It will include barre work, across the floor and center floor work. Jazz Technique 2 (Ages 10 and up) In this class students will focus on more advanced Jazz Technique to bring their dancing to the next level. This class will include a warm up, across the floor and center floor work. Ballet Technique 2 (Ages 10 and up) In this class students will focus on more advanced Ballet Technique to bring their dancing to the next level. This class will include barre work, across the floor and center floor work. Strength & Flexibility (Ages 10 and up) Strength and Flexibility on so important to every dancers performance. This class will focus on exercises to increase strength and flexibility where dancers need it most. Choreography (Ages 10 and up) In this class students will learn different choreography allowing them the practice of being able to pick up material quickly and execute. So You Think You Can Choreograph (Ages 6-9) In this class students will learn how to choreograph and practice creating routines. At the end of the session they will have a performance with their own choreography.